If you are reading this blog I bet your spirituality is recognisably an integral aspect of your life. Your friends know you to have a ‘deeper’ side. You are a truth seeker, and your connection to the Universe, God, angels, and your soul’s purpose are important to you. Am I right? When did your journey start? … Can you pinpoint that moment of spiritual awakening? Was it a book, someone’s talk or workshop, an article in a magazine, someone close to you, a life threatening experience? (I would love to hear your story). Spiritual growth, as you know, takes practice. Just as with a musical instrument, if we want to create beautiful music we need to practice our technique until we get it right; and like any fitness, sport or health project we have to exercise our muscles if we want to gain strength and improve our stamina. Many great teachers have pointed out that all we really need to do is let go of ego, be in the moment, still the mind, and simply ‘connect’. However, my own busy life and the pressures of a growing family, material and practical necessities such as utilities, food, clothing, medical care and mortgage show me clearly everyday how hard that is. 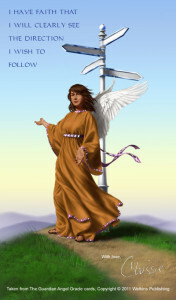 To find time for creating a sacred space to meditate and make that ‘connection’ with God and the angelic realms is not always easy. I do understand! But even with a family, a full time job and a home to run there are so many wonderful ways to devise a spiritual practice on a daily basis, no matter how busy you are. For example, as you wake and open your eyes, ‘Bless’ the day ahead – knowing that all will be well. Be mindful as you get out of bed and stretch holding your hands up and honouring the Heavenly Father and the angelic realms. Then touching the ground in front of you honour the Earthly Mother, giving thanks for everything she provides for us. As you shower let the water cleanse your aura, not just the physical body. And as you step out of the shower imagine you are stepping into a bubble of pure light as you intentionally protect yourself, and your energies, for the day. Then smile at your reflection, acknowledging the God within, and thank God, the angels, your guides and mentors and yourself, just for being here,…(no extra time taken) and this is just before breakfast! For those of you who are already involved with a spiritual practice and are considering ways to guide, teach, mentor or simply befriend others along their journey there are lots of courses and programmes to support you. Some of you will know I am involved in a Spiritual Companions programme and have been offering a five month course of spiritual development based on the Spiritual Companions Guidelines in Spiritual Practice. I’ll be running the course again this year, so if you feel called to develop your spiritual practice further please contact me, or look out for announcements..
And since I will be in the city over the weekend, there will be a Saturday workshop for all course students or those who are considerimg the course as a way forward. During the workshop I will be running through some of the key points and exercises from the course and answering questions. We’ll do some pair-work and group meditation too. Venue: to be announced once we know numbers. It will be in Belfast or the surrounding area. I also have a talk and workshop coming up in Letchworth, Hertfordshire and would love to see you there if you live in that area. As always check the website for more details. And don’t forget you can share this newsletter with your friends on Facebook and other social networks.